Cloudsound has unveiled a unique speaker design they have created in the form of the Ionomax which is a plasma speaker and provides a desktop audio system with two complete units. Watch the video below to learn more about the design and unique technology integrated into the plasma speakers which have taken to Kickstarter this week to raise the $55,000 they require to go into production. Kickstarter pledges are available from $399 for super early bird backers, with shipping expected to take place during December 2017. 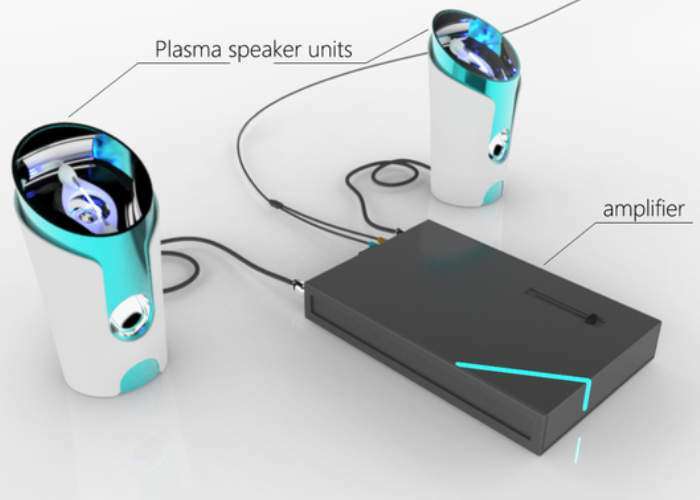 The development team behind the unique Ionomax plasma speaker explains more about its inspiration and design. The first application of plasma speaker was in the 1950s. Because of the technical limitations and the immature industrial, plasmas speakers had low performance and high prize. The invention of the plasma arc loudspeaker is an evolution of William Duddell’s “singing arc” of 1900. William Duddell was appointed to investigate carbon arc lamps solving efficiency and noise problems. During his experiments, he found that by varying the voltage supplied to the lamps he could create controllable audible frequencies. Duddell used this knowledge to create the singing arc and demonstrated the novelty on several occasions. However, Duddell never pursued marketing or a patent for the device. In 1956 Dukane marketed the “Ionovac” and was sold for $147. Unfortunately, the element lasted only 200 to 300 hours. Have you every think about listening music with a different way? Ionomax can bring a totally different experience for you. After a century, the plasma speaker is now redefined by us. Ionomax comes in two parts: the pre-amplifier and the plasma speaker units. Pre-amplifier is responsible for processing the audio signal to make it suitable for the plasma speaker output units to produce arc . Although the generation of plasma requires high voltage, ionomax is safe. The pre-amplifier operates at a safe low voltage. The plasma speaker unit also uses an isolated transformer to ensure safety. When the signal is transmitted into the power output module, the reliable component drives the high voltage transformer to generate a powerful voltage to generate a beating arc.